I’m blogging with some very exciting news this morning from Ocado HQ. We’ve received 400 applications for Britain’s Next #TopSupplier and last Thursday we invited the cream of the crop to meet our Senior Buying Team here in Hatfield. 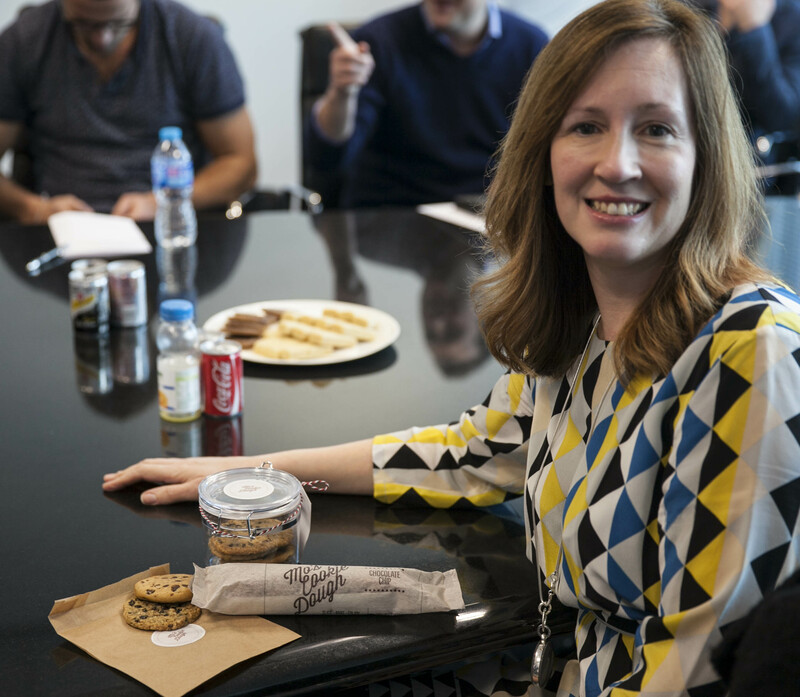 We hosted almost fifty small businesses, giving each one the opportunity to pitch their product to our experts and be in with the chance to win a 6 month exclusive listing at Ocado and a £10,000 marketing support package. After some intense debate and a run through a rigorous scoring system, our Senior Buying Team have whittled down the list to just five small businesses, who will now get the chance to pitch their product to retail legend Sir Stuart Rose, Michelin-starred Chef Tom Kerridge, Director of Marketing and Grocery Retail Lawrence Hene, and Rose Price, our Head of Buying. So, who are the final five? What makes them so special? Here’s a little run down on our line up. Hannah Rhodes is the woman behind Hiver Beers. After attending an urban beekeeping course, Hannah fell in love with honey and the stories behind beekeeping. With a background in microbrewing, she developed a honey beer recipe which showcases the flavour of the honey without being sweet. We loved the consideration Hannah put into every element of her product – right down to the glass bottle. Her business cards can even be planted to grow wildflower seeds for bees, and are made in the UK. Gouri Kubair set up Holy Lama Naturals, a family owned business which produces Spice Drops, a unique range of concentrated natural spice extracts. Their factory in Kerala, South India, is an ethical enterprise employing disadvantaged women in the local community, and they are members of the British Association for Fair Trade Shops and Suppliers (BAFTS). Our Senior Buyer, Andy, was blown away by the versatility of this product; Gouri demonstrated several practical ways you could use it to liven up plain yoghurt or make mulled wine in seconds. Morag Pavich drove all the way from Scotland to tell us about her product, Mo’s Cookie Dough, a prepared cookie dough which comes in a roll ready to slice and bake. Mo says her product was created for un-domestic goddesses who enjoy the idea of home-baking but perhaps don’t have the time or confidence to bake from scratch. Adunni Foods is a West African inspired ready meal brand, with all ingredients sourced and prepared in England by Yetunde Bolarin. Yetunde’s delicious home-cooking kept colleagues asking for more, so when she spotted a gap in the market for West African ready meals she was inspired to launch at Tatton Park Foodies Festival in Cheshire last June. Our Senior Buyer Gary couldn’t put the Beef Stew with Rice and Beans down! Laura Lewis describes her product LushIce as ‘a naughty-ish sorbet for grown ups’. The idea for these delicious alcohol-themed sorbets came from both a desire to explore dairy-free treats and the need to share dessert with her friends at a party – the perfect excuse! Laura’s packaging design is beautiful and I have to confess I rather enjoyed my spoonful of the Margarita flavour. So there’s your introduction to our five female finalists. Who are you hoping our judges will choose? 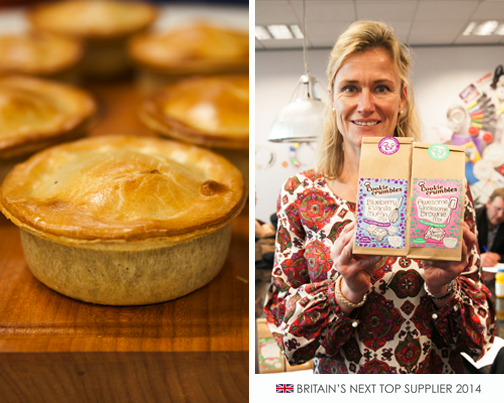 This entry was posted in Britain's Next Top Supplier, Talking Ocado and tagged all-women shortlist, beer, Britain's Next Top Supplier, competition, cooking from scratch, dough, finalists, food, foodie, meal solutions, sorbet, West Africa food by Naomi. Bookmark the permalink. I’m hoping your judges will pick Gouri. Her ethical species need to be in every kitchen in the UK :). Go for Mo…a perfect combination of ingredients…good raw materials, a great recipe, and the best of intentions…creating food the family can come together and enjoy. Hannah with “Hiver Bees ” this product sounds lovely and natural . Morag for sure-freshly baked cookies at the ready!! Def rooting for Laura and her Lush ices! Not in the least bit interested. Don’t send me this rubbish.